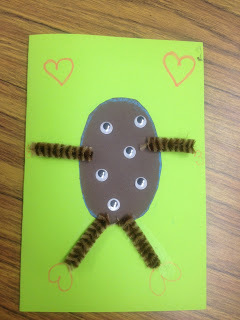 The “love potato” is an awesomely “delightfully awkward” Valentine’s Day Craft that kids and parents alike think is hysterical and definitely unique. The front of the card is a potato with googley eyes all over it, and inside it says “Dear X, I have eyes only for you. Be My Valentine? Love, Kid”. Choose color of card paper. Fold the paper in half to make the card. Open card to do message first. Copy or compose the message, making sure to include “I have eyes only for you.” within it. Draw a potato on a separate piece of brown construction paper. Cut out potato. Glue potato to front of card, in the middle. Add adhesive googley eyeballs to it (dollar store). Carefully cut pipe cleaners [best by adult] for arms and legs, or use construction paper, crayons, anything else to add in arms/legs. Glue arms and legs of whatever material onto the potato. Give to cherished person. Smile. Easier: Have a finished product to show, but then do the task step by step with the child, so that task is broken down and child is given sequence. Harder: Have no supplies out besides finished product, have kids gather necessary supplies, ideally ones out of sight that require some instruction to find. Provide child minimal instruction and give more than 2 (ideally 3-4) instructions at a time. Easier: Provide all or most supplies or have easily accessible. Give no more than 1-2 step directions at a time. Easier: Demonstrate how to match corners, and/or perform for child. Harder: Have child make own lines with ruler, and compose without verbal or visual cues. Or have child copy information off board. Easier: Have written model of desired writing, at “near-point” meaning right in front of the child, for child to copy. Harder: Thinner potato lines to cut out, or have child cut out arms and legs as well. Easier: Thicker potato lines, higher-contrast. Harder: Liquid glue (hard to regulate pressure/squeeze hard enough). Easier: Ideally a colored glue stick. Ensure child is adding to glue to back of potato, not to card front. Harder: Have child pull off own eyeballs, especially smaller ones. If you don’t have the adhesive kinds, putting glue on the eyeballs is hard/good practice. If adhesive, taking the tiny paper off back can be challenging. Easier: Provide eyeballs off chart, or use larger eyeballs. Be silly! Kids think this is so funny. The original post here from a year ago, which I copied and then modified slightly.